Rough-stalked meadow-grass is a short to medium somewhat coarse perennial grass. It can be quite variable in form and appearance depending on the circumstances in which it is growing. Whilst young it grows as loose tufts. With a good supply of moisture it grows luxuriantly and spreads out with numerous slender creeping stolons. In dry conditions it remains short and tufted and the plants acquire a reddish purple tinge. Its flat or folded leaves are generally low to the ground often mixed at the base of other grasses. Its flowering stems are slightly rough to touch (hence name) and can rise up to 60cm with branched heads; these are green and closed in moist conditions, open and tinged red in dry conditions. 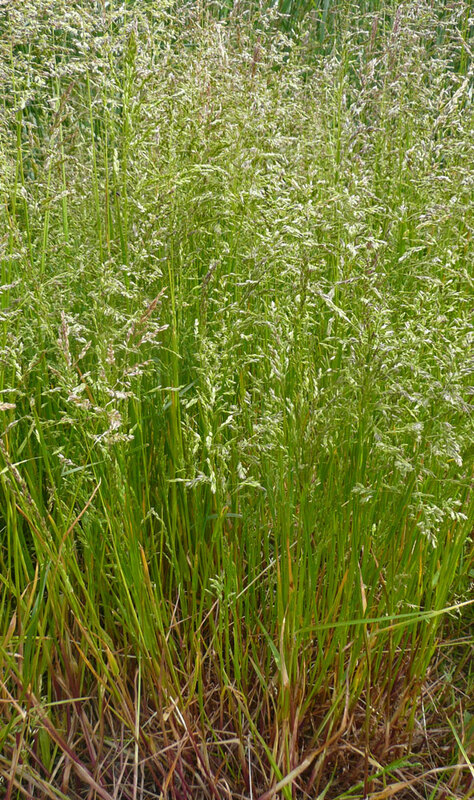 Rough-stalked meadow-grass is an adaptable species capable of growing in a very wide range of habitats. 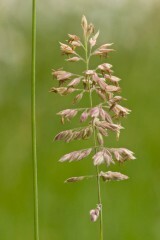 It is found in grassland including meadows, pastures and rough verges. 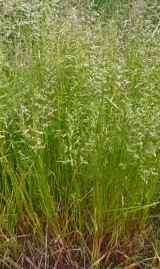 It grows well in wet ground in marshes and beside ponds, ditches and streams. It can survive drought in dry soils and on walls. It can regenerate from buried shoots after disturbance in waste ground and as a weed of cultivated land. It is also tolerant of moderate shade so also grows around open woodland, hedgerows and scrub. It grows most prolifically on damp fertile neutral soils. Rough-stalked meadow-grass can be sown at any time of year when conditions are suitable. It is capable of rapid germination and quick establishment over a wide range of soil temperatures. In good soil it can be quite competitive during establishment, potentially smothering weeds and slower growing wild flower seedlings. For this reason it is not included as a component in most wild flower seed mixtures. Rough-stalked meadow-grass readily regenerates from self-sown seed, buried seed in the soil, creeping stolons or detached shoot fragments. Its wide distribution throughout Britain combined with this ability to naturally regenerate does mean it is very likely to naturally colonise sown grassland without being a part of the original seed mix. Once established in mixed grassland it grows out down at the base of the sward, creeping to colonise any gaps. It persists as an under-storey plant able to tolerate shading from taller grasses and herbs, and only rarely, if ever, becomes dominant. 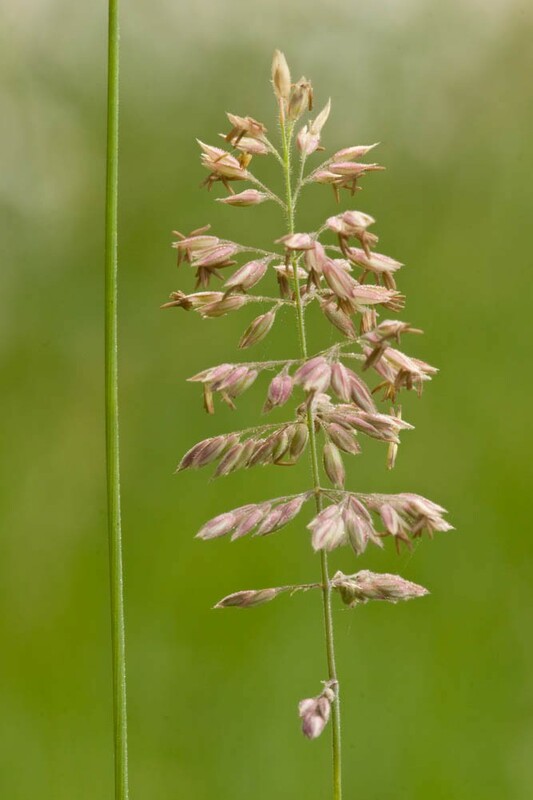 In spite of its name rough-stalked' both its leaves and stems are highly palatable to livestock and it was once added to agricultural grass seed mixtures as a ‘bottom grass' for meadows and pastures. In good moist soils it can also produce a useful quantity top growth which is easy to mow with a scythe to produce hay which old texts describe as "of the finest quality". It is a component of our old fashioned grazing mix EG27. It is a moderately shade tolerant grass, so whilst it is not the finest leaved grass, it is nonetheless a useful component of lawn seed mixtures for shade (especially damp shade), and is a component of our EG23 Shade tolerant turf mix. It has limited tolerance to either very close mowing or trampling, particularly with restricted light, so should be mown carefully and not too short. In shade it will also lack the energy to push through leaf litter so autumn leaf fall should be collected and removed.